November 8, 2017 | -by: Kevin George. When was the last time you challenged yourself or tried something new and exceptional in your emails? Or even deviated from the normal email design? It’s not always about sticking to something that has worked for your business earlier. With subscribers loving and accepting new ideas and technology giving a helping hand to innovate and create awesome email templates, it’s the best time to be in for email marketers. You’ve been using first name personalization in your emails. Great! However, with technology so advanced and people craving for personalized experiences, it’s time to add some more customization to delight them this holiday. Ask subscribers to fill out some profile details to be in a better position to create personas. The social media links you provide in your email footer are also helpful in this regard as you get an access to subscribers’ profile through the likes and followings on these platforms. Another way to get to know your subscribers better is through tracking cookies on website or email. This way, you can trace their browsing and purchase history. With the data you collect, you can send recommendation emails to help your subscribers buy gifts during the holidays, location-based event notifications, and customer loyalty emails to delight subscribers during the festive times. Check out this email from Chewy. It has been sent to a customer who has bought or regularly buys certain products from them. This email reminds them that it’s probably time to reorder. Plus, they are cross selling! Have you ever been bogged down by the debate of whether to place the CTA above the fold or not? Well, we think it’s essential but what if the problem is nipped in the bud? Yes, a fixed CTA that does not move irrespective of the scroll is possible. While the other content can be scrolled up and down seamlessly, the CTA stays fixed. Try this amazing element in your emails during the holidays so that your subscribers do not miss out on the CTA and find it easy to take action. Don’t we love to see the sunset? The transformation of day into night is an experience that makes us happy. Experiences play a vital role in our lives. So, wouldn’t it be great if you could create an experience in your holiday email to draw better engagement? A click-event based kinetic email can be your vehicle to stardom this year! An experience in email is created using a combination of GIF and keyframe animation. And since the subscriber needs to take an action (click on a CTA) to experience the animation, it automatically improves engagement and click-through rates. 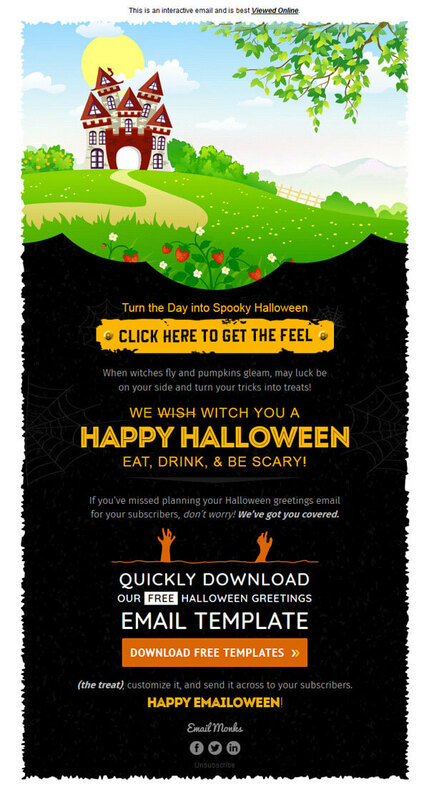 Check out this Halloween email created by EmailMonks. Isn’t it stunning? Millennials are video game freaks. Period. So, why not make the most of this trend to boost the success of your email campaigns? The good news is that you can create a gaming experience in your email, thanks to technology. Gamification not only improves engagement but also encourages subscribers to provide feedback or take surveys that you present through an interesting game. 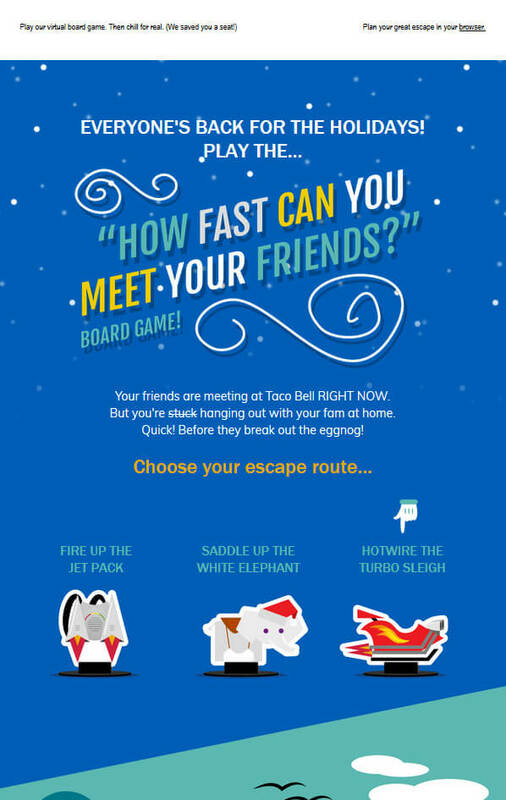 Have a look at this email from Taco Bell. They sent this email during Christmas, last year. GIFs are awesome, but maybe you think they are too commonplace. How about giving their close cousin, cinemagraph a chance? In a cinemegraph, maximum part of the image remains still and only one element is animated with seamless looping. This is perfect from the marketing point of view as you can successfully draw the attention of your subscriber to the most important part of the message. We came across this amazing cinemagraph created by Saks Fifth Avenue. Isn’t it mesmerizing? It’s when you divert from your regular path that you see plenty of opportunities waiting for you. So, are you ready to go that extra mile and give your subscribers something innovative this holiday? You must try these email advancements then. Hoping you great success in your holiday email marketing!